Mix all the ingredients for the marinate together in a mixing pitcher. Reserve 1 cup of the mixture to use with the salsa. Pour the remainder of the marinate into a large zip lock bag then place the chicken into the bag and zip it shut. Refrigerate the chicken in the marinate for at least 2 hours or longer before grilling. While the chicken is chilling, make the salsa. 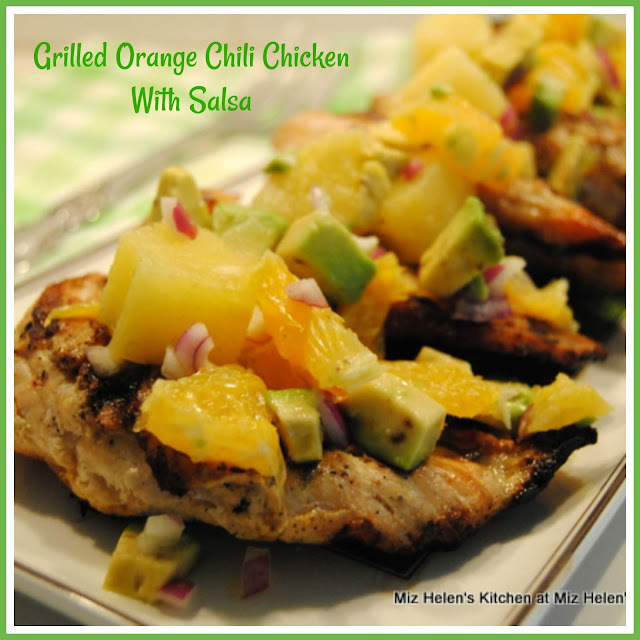 In a medium mixing bowl, mix together the orange, pineapple, avocados, red onion, and jalapeno, mix well. Pour the cup of marinate over the salsa and mix well. Take the chicken off the grill and let set for 10 minutes. I sure am glad that you stopped by to spend some time with us while we were grilling this delicious Orange Chili Chicken With Salsa. Hope you have a fantastic week and come back to see us real soon! That looks packed full of flavor and so fresh! Yum!